Writer. Story-gatherer. Every wonder tells a tale. The gift was loosely wrapped in soft, crinkly beige tissue. I held it upside down and backwards. Theresa flipped it gently. “It’s a goddess,” she, the giver, said simply. And so it was. 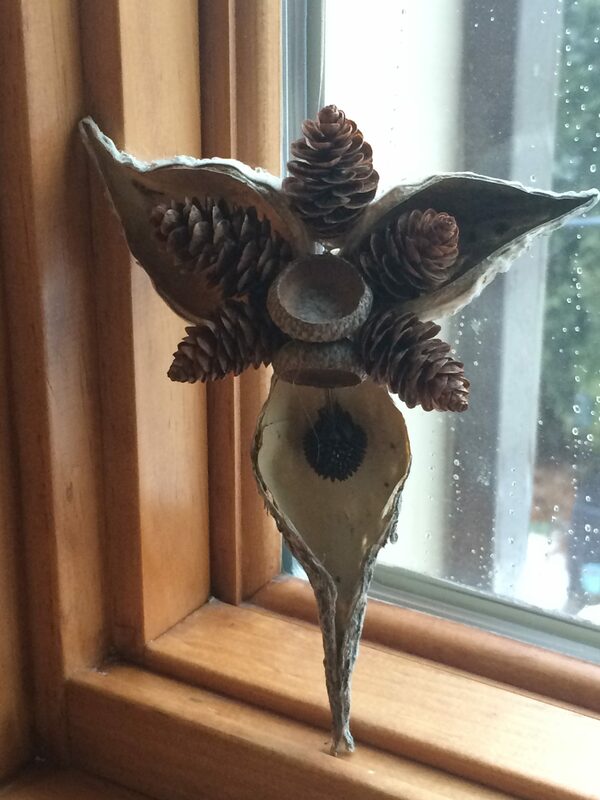 Hand-crafted together from milkweed pods, tiny pine cones, and acorn caps. Theresa had gathered them in Ohio, Illinois, quiet places, or maybe she carried the serenity inside herself, enough to pay attention when beauty appeared at her feet. deliver their keynote, they gave me the gift of time. Two hours to weave together my story as an Asian American writer, the power of stories to heal the world, and to share my passion for the history of babaylans, Filipino women healers. Two hours to listen to ninety women’s voices, a thoughtful and feisty chorus. Their stories and mine moved in and out, attached like an in-breath to an out-breath. Weaving. 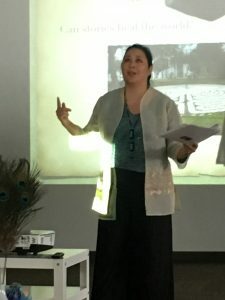 The two months I had to marinate and ponder the talk helped my understanding deepen about traditional, indigenous Filipino healers. As scholar-performer-oralist Grace Nono reminds us, babaylan are not our past. They are our present. They are modernity and change. Their existence speaks to the vibrance of indigenous Filipino culture that survived colonization. They still fight to protect nature and simply live. Stateside friends, think Standing Rock. Mother Earth, Inang Mundo, sings her Story. From our feet, grow roots, deep into the loam and the core of the planet. Through our shoes, souls can sprout through soles. We can anchor to the earth and remind ourselves of what is real. Why? Because power-hungry ghosts are trumpeting stories of fear, trying to keep us divided and afraid of each other. It is an old, base, yet effective tactic: Scare people into submission through story. There is another way. Stories can heal, too. Stories can shine compassion on everyone we’re being told are Bogeymen. Stories can focus on Mother Earth, her generosity, and the need for us to give back to her in thanks and reciprocity. What kind of stories are you choosing to tell? How will you share your gifts? This entry was posted in Filipino, Indigenous Spirituality, Mary Grace's Writing, Women's Spirituality by Mary Grace Bertulfo. Bookmark the permalink. M.G.- We were so blessed to have you share your stories and your spirit with us at the Unity Temple’s Women’s Connection Annual Retreat. It was both inspiring and energizing to work with you. I have learned from you, and am so happy that our paths have crossed. Your writing is amazing, and so important. Thank you, thank you, thank you. I’m honored to have been a part of it and so impressed with all the attention to detail, the mindfulness, and spirit of community at Women’s Connection. Thank YOU!